The Conkling Pleasure Club sign was pretty far gone when rescued in 1997. This late 1930's deco sign hung on the NE corner of Conkling and Dillon streets in Canton. The old democratic club closed as all the old member were 'dying off'. The century-old building was demolished in 2006. All neon units are original, and still light! 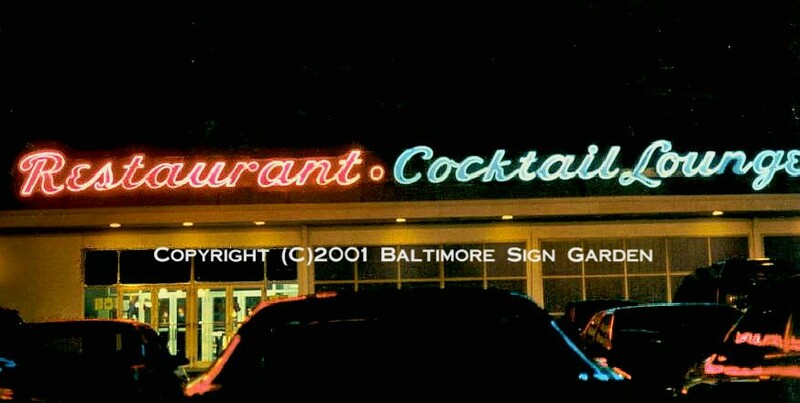 One of a set, this neon beauty graced the White Tower Hamburgers at Washington Blvd. & S. Monroe St. 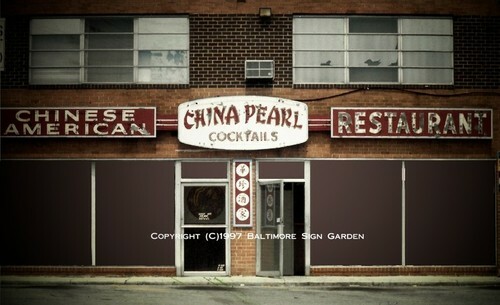 I remember checking them out after removal, when they sat behind the then closed building for several months. The one-ton signs disappeared. This one re-appeared 20 years later, and was offered to me for the collection. It was a bear moving this 8' high by 14' wide neon 'billboard'. Most of the tubes still light on this porcelain-enamel vintage sign. 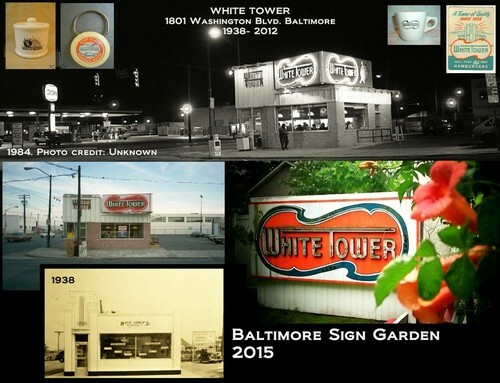 It is too big for my kitchen, where I display vintage White Tower coffee cups, plates, matchbooks and menus. Fabricator unknown. I grew up with this one. Located on Crain Hwy. near Furnace Branch Rd, this fellow swung on a pole overlooking Sawmill Creek at the bridge for 45 years when rescued in 1995. He awaits his new neon tube outfit. Fabricator unknown. My big feet were no match for this late 1930's icon on Poplar Grove St. near Franklin St. I'm told Mr. Bolini ran this shop for over 50 years when he retired. 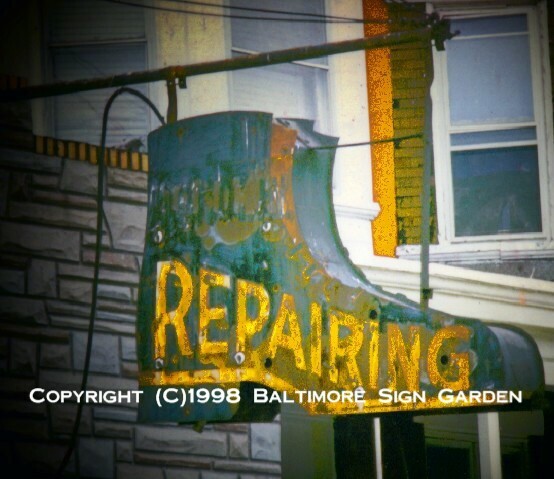 The shoe got the boot in 1998, but not without a fight from resident hornets. 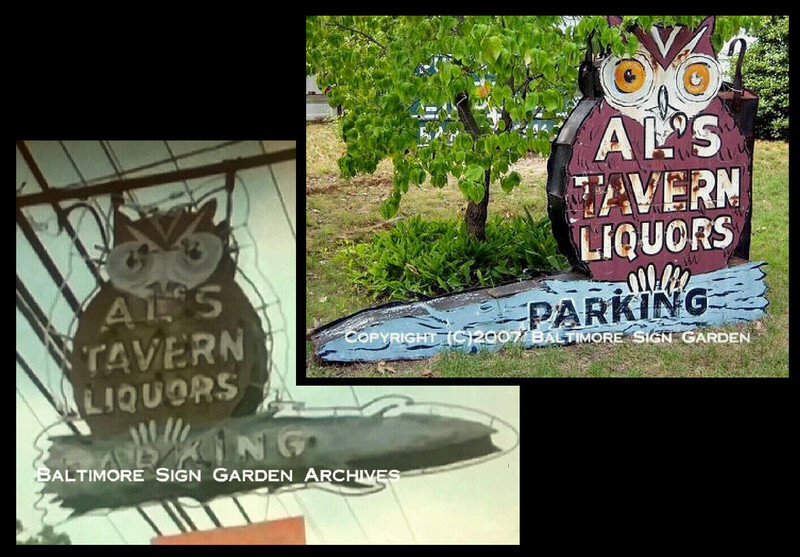 Built by Triangle Signs. This is why I needed a one-acre back yard. At just under 90 feet (in 7 sections), this well-maintained sign fell victim to political correctness. I also grew up with this one, at Bowl America on Ritchie Hwy. in Glen Burnie, MD. Original to the 1958 bowling alley, the Cocktail Lounge was also out of a 'Rat Pack' movie right up until it closed in 2001.The lounge portion is now a 'family amusement center'. Built by Triangle Signs. Located on Reisterstown and Fallstaff Rd near Pikesville, These were well maintained until the end. A major fire in 1999 reduced the entire building to a shell. Only the center section 'China Pearl' was salvagable. The restaurant never re-opened and the re-built complex housed other retail in 2006. Fabricator unknown.